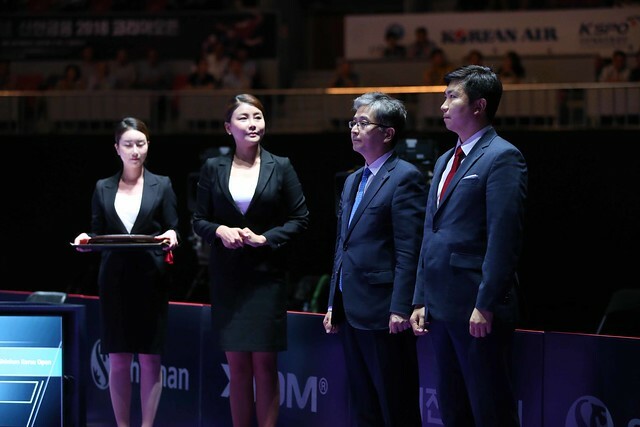 The defending champion, finalist on five previous occasions, the winner three times; Singapore’s Feng Tianwei suffered a shock opening round defeat in the Women’s Singles event at the Seamaster 2018 ITTF World Tour Platinum Shinhan Korea Open in Daejeon on Thursday 19th July. Occupying the no.9 seeded position; she was beaten in six games by 19 year old Miyu Kato (11-6, 11-13, 11-7, 9-11, 11-6, 11-8). A splendid performance from Miyu Kato and arguably it was a win waiting to happen. Eight months ago at the quarter-final stage in Sweden, she had given China’s Zhu Yuling a torrid time, extending the player who currently sits at the top of the Women’s World Rankings, the full seven games distance (11-9, 11-4, 12-14, 11-6, 10-12, 8-11, 11-4). Outstanding from Miyu Kato, in the opening round of the Women’s Singles event in the lower half of the draw, it was outstanding from Japan as a nation. Kasumi Ishikawa and Mima Ito emerged successful as status advised, like Miyu Kato, Saki Shibata upset the odds. Kasumi Ishikawa, the no.4 seed, beat surprise qualifier, the host nation’s Lee Nakyung (11-5, 11-7, 11-5, 11-4), Mima Ito, the no.6 seed, overcame a most worthy opponent in the guise of China’s Gu Yuting (11-6, 13-11, 12-10, 8-11, 12-10); thus she repeated the success enjoyed when the pair had met last year on the Seamaster 2017 ITTF World Tour in Germany. Good form maintained by Mima Ito but if there is any player this year who is maintaining form it is Saki Shibata; she overcame colleague, Miu Hirano, the no.7 seed (13-11, 7-11, 7-11, 11-7, 11-1, 15-13). Notably earlier this year Saki Shibata won the Women’s Singles and Under 21 Women’s Singles titles at ITTF Challenge Series tournaments in both Croatia and Spain, as well on the Seamaster ITTF World Tour securing the Under 21 title in Germany. Success for Japan and in the lower half of the draw in the opening round of the Women’s Singles event there was notable success for China. Zhu Yuling, the no.2 seed, beat Hong Kong’s Li Ching Wan (11-8, 11-6, 14-12, 11-5), Sun Yingsha, the no.11 seed, ended the hopes of DPR Korea’s Kim Song I (11-8, 11-5, 11-7, 5-11, 11-5), whilst Hu Limei upset the order of merit by overcoming Hong Kong’s Doo Hoi Kem, the no.13 seed (11-5, 11-7, 11-3, 11-4). Defeat for Kim Song I, likewise it was the end of the journey for colleague, Kim Sol Song; she was beaten by Korea Republic’s Suh Hyowon (11-5, 10-12, 11-8, 10-12, 11-7, 12-10). The second round of the Women’s Singles event will be played on Friday 20th July.